These are the lateral sepals. 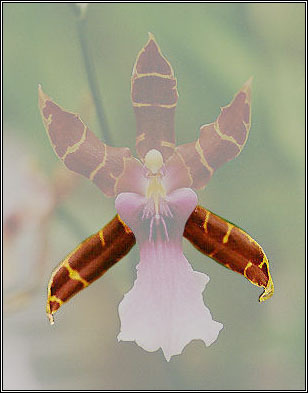 The sepals protect the inner part the orchid's flower while it is developing. They are usually the same color as the two lateral petals. They are, in general, narrower but hey can be as broad as petals like in Phalaenopsis flowers. In some genera the two lateral sepals can be partially or totally fused (they are called synsepals) and make a floral part such as in Paphiopedilum genus or become the major element of the flower like in Masdevallia genus. In that genus, they are usually fused to some degree to form an open cup or a tube and sometimes have tails on the tips. They can be elongated like they are in Brassia species or covered by warts and bordered by hairs. The third sepal is called dorsal sepal which can be prominent like in Paphiopedilum flowers.